A Thing (or Two) About Holly Jean: I'm Off To Disneyland! I'm packing my bags again, the new year 2012 is going to be a fabulous one with many travels and celebrations too. First up in the first weekend of the new year, I'm off to Hong Kong Disneyland! Looking back at our photos makes us excited about this upcoming trip. Everyone remembers their favourite childhood cartoons and magical Disney moments. Hong Kong Disneyland is only a few hours away from Singapore. We are flying there on Friday 6th January. We're also planning to squeeze in lots of good food and shopping into our weekend in HongKong. Toy Story Land is now open at Disneyland, it's the first in Asia. It's like playtime in Andy's backyard where everything is giant sized and you are toy sized. There's also a rollercoaster ride called RC racer which I am looking forward to! Catch you next week at HK Disneyland!! Stay tuned for updates, I will blog while I am there. 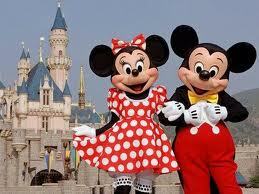 Disneyland Post 1 (Click Here) - All about transport/food/accommodation. That's how everyone dress 17 years ago la. Anyway, have fun over the New Year!